Honey bees are able thrive in Birmingham due to the abundance of flowering plants and pollen available. The pollen season usually last from March through May. During this time a thick layer of yellow pollen seems to coat everything including vehicles. When it downpours, one can usually see yellow streams of pollen flowing down the streets and walk ways. The bees take advantage of all this pollen, and use it for food for their colony, resulting in a population explosion. This is the time when honey bee colonies split and swarm into new locations. Southeast Bee Removal has received many calls from places needing bee removal in Birmingham, AL. Several apartment complexes have reached out to us that have had major honey bee infestations. Sometimes two, three, four, or more hives have been in one apartment community. If a place is experiencing numerous infestations, I always recommend taking care of the problem as soon as possible. Existing colonies can continue to split and multiple into new places until they are removed. Another thing to do would be to seal troublesome cracks and gaps on the building or the bees almost will certainly be back the following year. Three Treatments of Pesticides did not Remove Birmingham Bees! Have you been trying to get rid of the bees all summer and they just won't seem to go away? Even though you may only see a few honey bees flying in and out of an entry point, there may be 50,000 or more honey bees inside the structure. 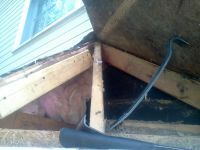 Southeast Bee Removal was called to take care of a bee problem in Birmingham where this was the case. A well meaning pest control company had treated an infestation of honey bees in a bay window. They came out three times to treat and were unsuccessful in killing the bees. The pesticide wasn't reaching back to the nest and the population of honey bees was too large to wipe out. If the pest control company had been successful in killing the honey bees, another problem quite possibly could have occurred. Any honey in the hive would have been eaten through by pests. Then it could have started dripping down on the drywall in the kitchen and ruined the ceiling. After a couple of months, the home owner was at their wits' end on trying to solve this bee problem. They were very happy to finally find Southeast Bee Removal. When I arrived at the job, it was fairly easy to locate the bees nest which was directly under the shingles of the bay window in the kitchen. I was able to do the job from start to finish. 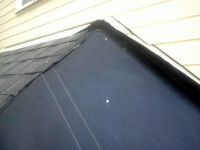 The first step was removing the shingles. (These can usually be saved and reused if they are in good condition. 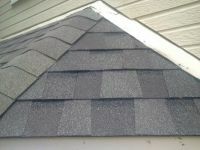 However, the homeowner had new shingles which we used when we did the repairs.) Then I removed the tar paper, and plywood to expose the hive. 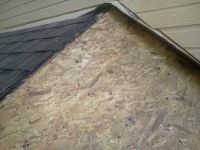 After removing the bees, comb and honey, the area was bee-proofed by filling the void with insulation. Then everything was carefully put back together and sealed with a high quality caulk. Once the job was complete you would never know bees had ever been there. It was a win-win-win. 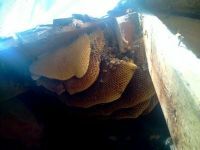 The homeowner was happy to have their bee problem permanently solved, the bees were happy to be relocated to a place where they could thrive and not bother people, and Southeast Bee Removal was happy to get the job. Southeast Bee Removal provides professional bee removal and relocation services in the southeast including: Birmingham, Hoover, Bessemer, Vestavia Hills, Meadowbrook, Alabaster, Gardendale, eastern Alabama, and the surrounding areas. For a free bee removal estimate give us a call today. We look forward to serving you!